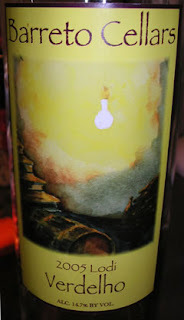 Onewineperweek gets back on track with this week's wine, a 2005 Verdelho produced by Barreto Cellars. This bottle was a sample, received compliments of Marshall at WineQ; it is not something currently carried by WineQ but is available direct from Barreto for $15.99. What I really liked about this light straw-colored wine were the aromas. It was a pleasure to keep swirling and inhaling generous scents of honeysuckle, citrus blossom and apricot, mixed with a lesser bit of peach and a subtle grassy component. When it came time to taste, it was markedly different on the palate than the nose. An initial fruity sensation gave way pretty quickly (as in just 2 or 3 seconds) to a load of grapefruit. While crisp, it continued to become increasingly tart and led to a tart, sourish grapefruit finish mixed with grassiness. That was the first night. On two subsequent evenings (preserved using Private Preserve), the aromas were consistent but the grapefruit quality on the palate smoothed out and some pear emerged. Verdict: One thumb way up for the arresting, fresh and pure aromas. One thumb tending toward the other direction for the rather simplistic and overly-grapefruity taste, which I really didn't care for. On the other hand, I must add that it would make a good match for spicier foods. It's like two, two wines in one! This wine will be live soon on WineQ, though! What star rating would you give it? I guess I should add that the wine is well made but I am not a huge grapefruit fan (e.g., I much prefer smelling a New Zealand Sauvignon Blanc to drinking it). Nevertheless, I still want to try the Twisted Oak version.. I guess because I am twisted myself. Star rating - probably 3.5 to 4 stars - I really loved the aromas and I think some (maybe many) would like the grapefruit aspect.